Trying new things helps make us happy, successful and confident. What if there were an easy way to be happier, smarter and more confident? We’ve all heard that one before, but this is no empty promise. Experts aplenty, including several scientific studies, agree that adding new experiences will help us achieve those goals. Novelty makes us happy, as anyone who has spent hours playing with a new gadget will attest. Trying new things jolts us out of our rut and makes us pay attention. And by working small risks into our everyday lives, experts say, we can feel better prepared to face big change. Matt Wight, principal of Apex High School, encourages both his children and his students to challenge themselves on a regular basis. This fall he will follow that advice himself when he becomes principal of Apex’s new Friendship High School. Seeking challenges and opportunities to grow keeps us engaged and happy, Wight says, but as soon as we become complacent, we cease to make our best effort. Stefanie Zizzo, a career and life coach from Apex, agrees. At one time she didn’t consider herself a risk-taker. But since moving from New York nine years ago and starting her own business, she now consistently looks for ways to challenge herself and encourages her clients to do the same. Zizzo also asks her clients how they might be getting in the way of their own success. So believe in your own new beginning, and don’t be afraid to step outside your comfort zone. Marsha Wrenn Snyder, at her home studio in Cary, prepares flowers for an upcoming wedding. Stefanie Zizzo offers these general guidelines for folks who want to make a career change. She cautions they may not work in every situation, but it’s a good way to start thinking about your next big change. The first step is to figure out what matters to you and who you are. “Often people want to jump right in to how to make something happen, but if they don’t know what they actually want to happen, they’re going to be stuck,” Zizzo said. The easiest way to solidify all the vague notions swirling around your head is to make a couple of lists. 1. Take stock of what is working. Look at successes in your current career and in your past, as well. This should include any community service or volunteer work. What was your best experience? Where did you shine the most? Where did you really use your strengths? 2. Define what is missing. This can be something that you wish were present in your job. This list can include things you dislike, but try to turn the negatives around in order to define what you really want. After making the lists, it will be easier to figure out what was making you happy. Was it where you were working, or what you were doing? “People often think it’s the whole career that needs to change, when sometimes it’s just the place that needs to change,” Zizzo said. If where you work is more important, explore different industries and various organizations that may be a good match for what you want. If what you’re doing matters more, explore different roles that play to your strengths. Read about it, talk to people with experience, and experience it for yourself. Ideally all three of these exploration methods should be used. Identify two or three viable options, and design a plan of action to accomplish your goals. This plan should include specific action steps. Your plan of action will include an inventory of knowledge, skills, strengths, experience and education. How do these assets align with your goals? Look at what’s there — not what’s missing — and that’s how you market yourself. Your assets will shape your entire job search. “The biggest risk I have taken is starting my own business after being laid off several years ago from an engineering firm. Jobs were hard to find, [so eventually] … I decided to open a small retail shop. Did I have any retail experience? No, not even a little bit. I had worked in engineering for 30-plus years. Yes, it was a little crazy to do something completely different, but somehow I have found a retail niche. I started with my favorite things — hats and teas, and have now expanded with specialty food items, along with locally made hand lotions, sprays and soaps. 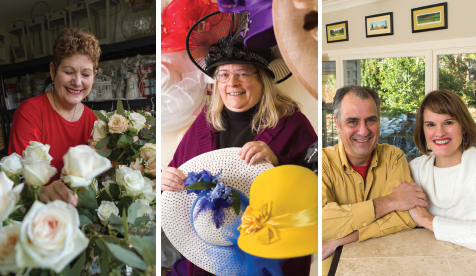 Bobbie Asad sells hats, teas, specialty food items and locally made personal care products at her shop, The Mad Hatter, in Fuquay-Varina. “It was a difficult decision to uproot ourselves after 17 years in Charlotte. We tried changing attitudes and activities but to no avail. Because my husband worked from home, we did not have to look for work, so we began looking at where we eventually wanted to retire. 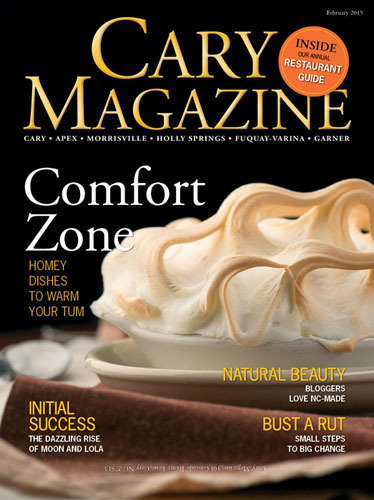 Our thoughts kept coming back to the Triangle, particularly Raleigh and Cary, but we wanted to be as sure as possible that we were choosing to go toward a new life. We were looking for good public schools, outdoor activities, universities and all they offer in programming, top-notch medical facilities for when we retire, proximity to family, and a relaxed community atmosphere. Although it was difficult to leave Charlotte, John and Karen Price are happy they decided to move to Cary.